Historians suggest that the law is implicit in a paper by James Clerk Maxwell, published in 1865. Hendrik Lorentz arrived in a complete derivation in 1895, identifying the contribution of the electric force a few years after Oliver Heaviside correctly identified the contribution of the magnetic force. where ℓ is a vector whose magnitude is the length of wire, and whose direction is along the wire, aligned with the direction of conventional current charge flow I.
is the covariant differential in general relativity (metric, torsion-free). ^ The H-field is measured in amperes per metre (A/m) in SI units, and in oersteds (Oe) in cgs units. "International system of units (SI)". NIST reference on constants, units, and uncertainty. National Institute of Standards and Technology. Retrieved 9 May 2012. ^ a b Huray, Paul G. (2010). Maxwell's Equations. Wiley-IEEE. p. 22. ISBN 0-470-54276-4. ^ a b Per F. Dahl, Flash of the Cathode Rays: A History of J J Thomson's Electron, CRC Press, 1997, p. 10. ^ a b c Paul J. Nahin, Oliver Heaviside, JHU Press, 2002. ^ a b See Jackson, page 2. The book lists the four modern Maxwell's equations, and then states, "Also essential for consideration of charged particle motion is the Lorentz force equation, F = q (E+ v × B), which gives the force acting on a point charge q in the presence of electromagnetic fields." ^ See Griffiths, page 204. ^ For example, see the website of the Lorentz Institute or Griffiths. ^ a b c Griffiths, David J. (1999). Introduction to electrodynamics. reprint. with corr. (3rd ed.). Upper Saddle River, New Jersey [u.a. ]: Prentice Hall. ISBN 978-0-13-805326-0. ^ Delon, Michel (2001). Encyclopedia of the Enlightenment. Chicago, IL: Fitzroy Dearborn Publishers. p. 538. ISBN 157958246X. ^ Goodwin, Elliot H. (1965). The New Cambridge Modern History Volume 8: The American and French Revolutions, 1763–93. Cambridge: Cambridge University Press. p. 130. ISBN 9780521045469. ^ Meyer, Herbert W. (1972). A History of Electricity and Magnetism. Norwalk, Connecticut: Burndy Library. pp. 30–31. ISBN 0-262-13070-X. ^ Verschuur, Gerrit L. (1993). Hidden Attraction : The History And Mystery Of Magnetism. New York: Oxford University Press. pp. 78–79. ISBN 0-19-506488-7. ^ Darrigol, Olivier (2000). Electrodynamics from Ampère to Einstein. Oxford, [England]: Oxford University Press. pp. 9, 25. ISBN 0-19-850593-0. ^ Verschuur, Gerrit L. (1993). Hidden Attraction : The History And Mystery Of Magnetism. New York: Oxford University Press. p. 76. ISBN 0-19-506488-7. ^ Darrigol, Olivier (2000). Electrodynamics from Ampère to Einstein. Oxford, [England]: Oxford University Press. pp. 126–131, 139–144. ISBN 0-19-850593-0. ^ Darrigol, Olivier (2000). Electrodynamics from Ampère to Einstein. Oxford, [England]: Oxford University Press. pp. 200, 429–430. ISBN 0-19-850593-0. ^ Heaviside, Oliver (April 1889). "On the Electromagnetic Effects due to the Motion of Electrification through a Dielectric". Philosophical Magazine: 324. ^ Lorentz, Hendrik Antoon, Versuch einer Theorie der electrischen und optischen Erscheinungen in bewegten Körpern, 1895. ^ Darrigol, Olivier (2000). Electrodynamics from Ampère to Einstein. Oxford, [England]: Oxford University Press. p. 327. ISBN 0-19-850593-0. ^ Whittaker, E. T. (1910). A History of the Theories of Aether and Electricity: From the Age of Descartes to the Close of the Nineteenth Century. Longmans, Green and Co. pp. 420–423. ISBN 1-143-01208-9. ^ See Griffiths, page 326, which states that Maxwell's equations, "together with the [Lorentz] force law...summarize the entire theoretical content of classical electrodynamics". ^ See, for example, Jackson, pp. 777–8. ^ J.A. Wheeler; C. Misner; K.S. Thorne (1973). Gravitation. W.H. Freeman & Co. pp. 72–73. ISBN 0-7167-0344-0. . 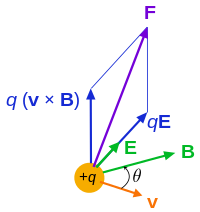 These authors use the Lorentz force in tensor form as definer of the electromagnetic tensor F, in turn the fields E and B. ^ I.S. Grant; W.R. Phillips; Manchester Physics (1990). Electromagnetism (2nd ed.). John Wiley & Sons. p. 122. ISBN 978-0-471-92712-9. ^ I.S. Grant; W.R. Phillips; Manchester Physics (1990). Electromagnetism (2nd Edition). John Wiley & Sons. p. 123. ISBN 978-0-471-92712-9. ^ "Physics Experiments". www.physicsexperiment.co.uk. Retrieved 2018-08-14. ^ a b See Griffiths, pages 301–3. ^ Tai L. Chow (2006). Electromagnetic theory. Sudbury MA: Jones and Bartlett. p. 395. ISBN 0-7637-3827-1. ^ Roger F Harrington (2003). Introduction to electromagnetic engineering. Mineola, New York: Dover Publications. p. 56. ISBN 0-486-43241-6. ^ M N O Sadiku (2007). Elements of electromagnetics (Fourth ed.). NY/Oxford: Oxford University Press. p. 391. ISBN 0-19-530048-3. ^ Classical Mechanics (2nd Edition), T.W.B. Kibble, European Physics Series, McGraw Hill (UK), 1973, ISBN 0-07-084018-0. ^ Hestenes, David. "SpaceTime Calculus".